Remember that contest I told you all about? Well, I won! Initially, I was nervous sitting there listening to all the rules and stipulations about rubrics. 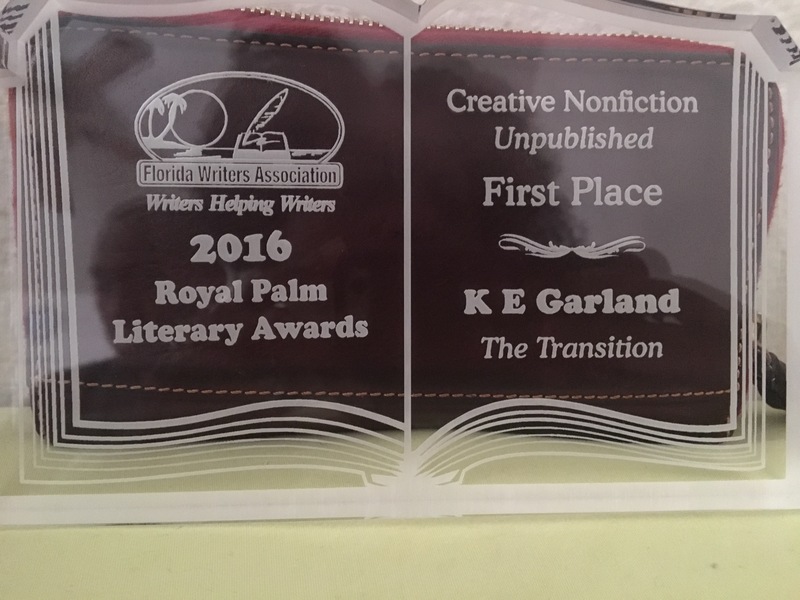 When Chris Coward, the president of the Florida Writers Association read my name, I couldn’t believe I’d actually won first place for creative nonfiction. “The Transition” is the story of how I shifted from bitterness to compassion for my father, while he shifted from life to death due to his cancer diagnosis. I want to share it here, but cannot because I’ve submitted it for The Binge-Watching Cure, a paid book publication. Instead of posting it, I want to tell you something I find odd. In 1983, my mother had a kidney transplant. Consequently, at ten years old, I wrote a book called On the Farm. It was the story of a little boy whose dad had died. The boy had to learn how to take care of the farm and his family. My fifth grade teacher, Mrs. Patterson submitted it for a citywide competition, sponsored by Gwendolyn Brooks. Remember, I grew up in Chicago so this was a huge deal. My grandmother and I dressed up in church attire and attended. My mother was still in Madison, Wisconsin recovering from her transplant. I didn’t win. But 33 years later, I find it quite strange that I won a competition for a story I wrote about losing my own father. Today, everything is still surreal. However, if I can say anything to all of you who read my words, it is this: Carpe Diem! That was the 2016 Florida Writers Association’s theme. Seize the Day! Do what you want! Live life and experience it however you see fit. And have faith that everything is working out for your highest good. Congratulations on this amazing achievement! Sometimes you just know you connect with someone special. This prize just confirms it, not that I needed that 😉 So, CONGRATULATIONS dear Kathryn! Lol yes we’d have a special connection no matter the award 😉 thanks for the congrats! Thanks so much! I thought I’d responded already. Yes! I don’t remember you mentioning it, but congratulations! I know you deserve it! That’s alright lol I appreciate the positive words anyway 😉Thanks Kelley! This came at perfect timing for me, thank you K E. I especially love (and am working) this line: And have faith that everything is working out for your highest good. Good! 🙂 It’s still coming your way!!! Blessings, K E.
Kathy, my friend, you are on quite the writing accomplishment roll right now. I am so thrilled for you. Fill up your heart and confidence with your award and book publication, and revel! I start your book tonight! Well, congratulations my fellow Floridian. This is exciting and you deserve it. And yes live life to the fullest. Thanks JC! We weren’t too far from you, in Orlando. Appreciate your kind words my dear! Thanks Annika! The anticipation nearly killed me. It’s like you wanna win but you wanna prepare in case you’ve lost lol like I didn’t wanna break down at the table of strangers 😉 thanks for your words here! I can feel your excitement at your amazing achievement. I am excited for you too not only because you are an amazing writer, but because I think you have come so far. It can’t have been easy for you to write about such a personal relationship. I feel as if you have not only won the prize for your writing, but you have been awarded for moving from bitterness to compassion. That can’t have been easy thing to do. A double achievement-well done! Omgosh Marie! I’m glad you can feel it through this screen and thousands of miles away cause you could’ve knocked me over with a feather that night. Also, yes, yes and yes to personal growth. I was thinking this AM that while I’d much rather have my parents here with me than an award, that’s just not the journey. I have peace and I’m happy to share that road with everyone. You know, I think Kathy, that self-growth and hardship are indelibly linked. One is definitely a product of the other: amazing lessons are learned through soul pain. You couldn’t have shared your journey of enlightenment without suffering. Isn’t that how life’s lessons are learned? Lol of course! Disagreements are welcomed here. I fully understand your point. Wow! Congratulations! Hope some day you’ll be able to publish it here. Congratulations, Kathy! That’s terrific. I hope to be able to read the story one day. Thanks! I hope so too girl. And I haven’t forgotten about the other post with the Hepburn quote. Was just a super busy weekend. Congratulations!!! I subscribe to the Florida Writer’s Association newsletter and saw the an email this morning that said they’d had a 22 percent increase over last year and almost 500 entries. But I didn’t look at read the winners. I didn’t think I knew any of the entrants. Then I scrolled up and saw your email notification that you’d won. Wow!! Congratulations!!! I remember reading a blog entry that talked about you going to your dad’s funeral. I enjoyed reading it. Was that the entry? Thanks Lynette! No, it was a series of posts I had kind of journaled leading up to the funeral. With another blogger’s help, I did some major revisions and submitted.